Customize this book style badge case with the badge shape cut-out that matches your badge. Get a recessed perfect fit when you supply your badge model. 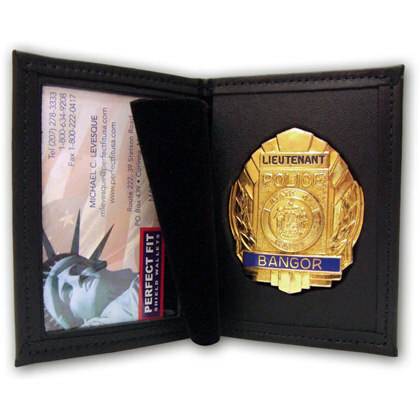 This badge case has a window to hold your ID and a felt cover flap to protect your badge. If you don’t know the model or manufacture of your badge, please e-mail a photo prior to ordering or check out the universal badge holders. Made In The USA by Perfect Fit. Stop Skimmers! Protect Your Information.